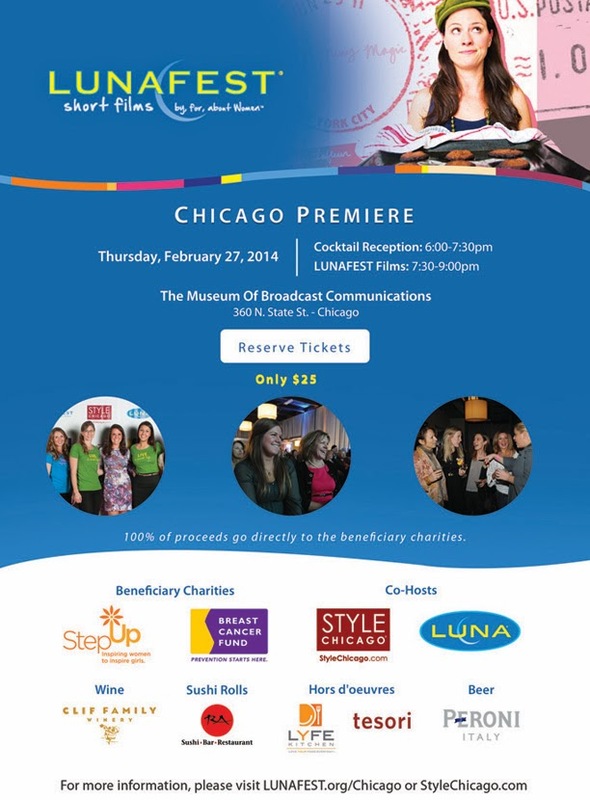 The Yoga Life Chicago: The Yoga Life Chicago Giveaway | LUNAFEST! The Yoga Life Chicago Giveaway | LUNAFEST! Hey there yogi's, I'm headed to LUNAFEST on February 27th and you should too! The Yoga Life Chicago is giving a set of two tickets to one lucky individual. Scroll down to enter for your chance to win tickets to this lovely event. Wait, what's LUNAFEST, you ask? LUNAFEST is a festival of nine inspiring short films by women filmmakers, for women - and helps support the Step Up Women's Network and Breast Cancer Fund. Great trailer right? Now that you're excited, scroll down a tiny bit further, and enter this awesome giveaway! Side note, if you never get lucky with this kinda stuff, don't worry. We've got you covered. Use this promotional code (LUNA5) to save $5 on your ticket ($20 ticket vs. $25). Tickets must be purchased in advance at www.lunafest.org/chicago. Wohoo! Have a great week yogi's!